In the modern era of NFL football, the Cleveland Browns are one of the few remaining teams not to have a professional cheerleading squad. The closest they have ever had was an all-girl marching band, depicted here. Pittsburgh Steelers, New York Giants, Chicago Bears, Detroit Lions and Green Bay Packers (the New York Jets introduced cheerleaders in 2007). 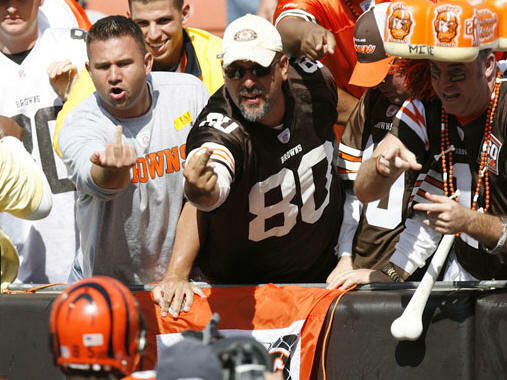 When people ask why the Browns don�t have cheerleaders, the most common answer given is their old-school mentality. This is, after all, a team which doesn�t feature a logo on the side of their helmets, instead preferring a solid brown color scheme. Another reason given is Cleveland�s cold temperatures in the fall and winter months. Since they have an outdoor stadium, this would make for very uncomfortable conditions for a cheerleading squad. It should be pointed out, however, that the New England Patriots have cheerleaders, and temperatures at Foxboro stadium during the second half of the season are just as frigid as those at Cleveland Browns Stadium. While the Browns have never had an official group, they have had cheerleaders on the sidelines during home games. In years past, this took the form of cheer squads from local high schools. 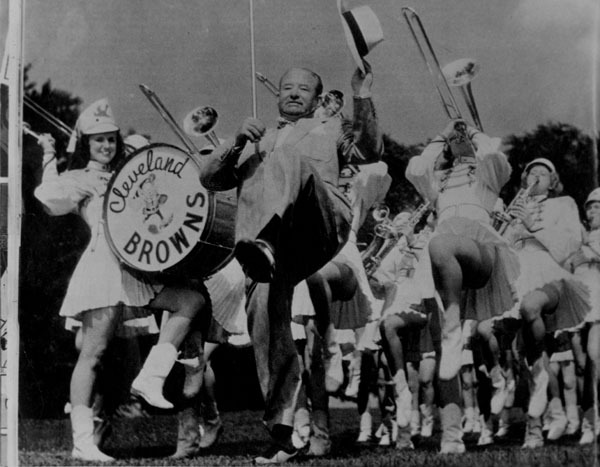 During the 1940s, the Browns even had an all-girl marching band. In the picture above, you can see team founder Arthur B. McBride having a little fun with the leggy girls from the 1947 squad. Will the Browns Ever Have Cheerleaders? Every year, at last one cheerleader thread seems to be started on every Browns� fan forum. While the issue seems to greatly irritate a number of purists, there are also a large amount of fans who post in favor of adding cheerleaders to the Brownies. As of this writing, the poll has only garnered 25 signatures. At the end of the 2007 NFL season, a season ticket holder year end survey included several questions about cheerleaders. This has led many to speculate that Cleveland Browns cheerleaders will be added sometime in the not-so-distant future.